LOS ANGELES— In a Thursday night matchup, the No. 11 Saint Mary Gaels (24-2, 13-0 WCC) took on interstate rivals, the Loyola Marymount University Lions (7-17 2-11) in a West Coast Conference game. The battle would be majority one-sided throughout the game. The Gaels focused and handled their business beating the Lions 83-62. 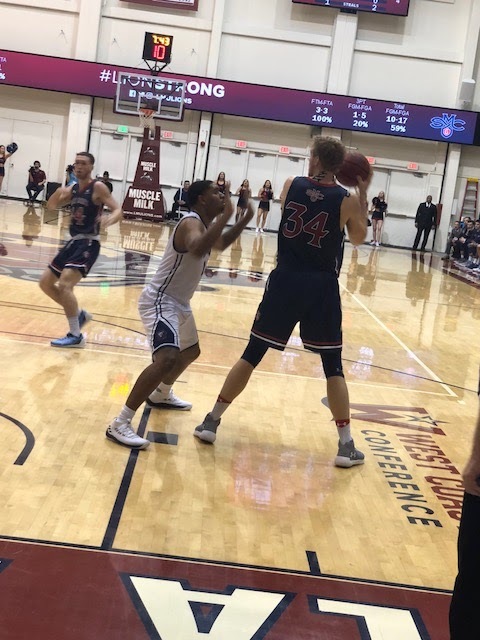 Saint Mary’s jumped out to an early 20-8 lead over the Lions, which was led by a well-rounded attack; knocking down three-pointers, lobs in the paint, driving to the lane and playing tough and pesky defense on the other end of the floor. “So to come in here and be able to control the game from start to finish, our focus had to be good. As a team it was good,” Saint Mary’s coach Randy Bennett said. The Lions would only see the lead for exactly 26 seconds during the entire first half. 13 of Jock Landale's 21 points came in the first half on 4-of-5 shooting, which gave them a 40-31 lead after 20 minutes. “I think we got off to a great start. We were getting good looks down from Calvin, shooting a lot of good 3’s. We just had guys clicking on all cylinders,” Landale said. The phrase says “history repeats itself”— this was certainly true for the game. Saint Mary’s kept firing on all cylinders in the second half. Frustrating the Lions with suffocating defense on the in and outside. Their frustration boiled over causing LMU coach Mike Dunlap to yell at the referee for what he believed was a miss foul call. Culminating in him receiving a technical foul. “We tried to take the 3-ball away from them. They [Saint Mary’s] are one of the best in the country at doing that. Then you are going to give up some stuff in the paint. We made a nice push back, that game could have been 20 easily in the first half,” Dunlap said. Point guard Jordan Ford from the Gaels would get a career high in points with 20. Having a hot and perfect hand from long distance - not missing a shot. “I think its been coming on - he has been coming on as a player. As the season gone on second half. He just keeps getting better, more confident” Saint Mary’s coach Ryan McCrary said. Not much went well for the Lions during the game. However, one bright spot was Eli Scott who led his team in points and rebounds. Contributing 16 points and gathering 10 rebounds for another double-double. “Well he [Eli Scott] is a special freshman and we know that and his numbers are good. He is powerful. Smart and he is learning. He just continues to progress both offensively and defensively, he is figuring some things out. I am proud of his effort,” Dunlap said. No. 11 Saint Mary’s will host the No. 12 Gonzaga Bulldogs (21-4, 11-1) on Saturday at home in what should be a good game and may determine the WCC regular champion. This will mark the first time in conference history two top 12 teams will face each other. The Lions will get back into action on Saturday as well. Taking on the area rivals the Pepperdine Waves (4-21, 1-12).